Go to the internal touch screen near the entrance in store. The store manager at Asda Gosport is Stuart Andrews. If you need to contact the store for any reason, please use the phone number on the left. 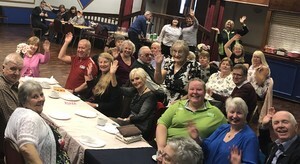 Our Gosport store's community champion Rachel Webber has a great relationship with the Gosportarians community group – so when she suggested organising an afternoon tea dance for local people who may otherwise be lonely they worked together to bring her idea to life. Rachel and Rhiannon from our Gosport store joined in the fun at Leesland School's Easter fundraiser and also helped them raise more than £1,000 towards updating their swimming pool.Pupils played games and met the Easter bunny while tucking into hot cross buns donated by the store. Community champion Rachel said: "There was so much excitement – we helped out with the raffle and tombola. Thanks also to the Gosportarians for arranging for the Easter bunny to come along." My first litter pick of the year went down really well. We organised to clean up of the coastline line near our store. It is always great to see people coming out and working together to make our community better. I was joined by Dani from our Portsmouth store and Heidi form our Fareham store who did an amazing job. Our store manager Stuart, fresh manager James and myself gave the children from Hasleworth School a tour of the store. The children had been reading the story Supertato in class and this led on to discussing where their food came from. The children enjoyed being quizzed by Stuart and James about where our food comes from. The children had fun having a go on the checkouts and we finished off with fruit kebabs with a few goodies to take back to school. The children really enjoyed their time in store and I will be following up the learning with the school toolkit in the coming months. On World Book Day I enlisted the help of local group Gosportarians (who generously offered to be the gruffalo) and the Reilly Enterprise (who very kindly lent us the gruffalo mascot). We visited local schools to read stories and have a meet and greet. The children at Gomer Infants really enjoyed their visit. I love seeing the children having fun and enjoying books, the world around them opens up once they learn to read. The bond you make sharing a story and the joy in a child's face is priceless. Being an Asda community champion is so rewarding. Many thanks to Malcolm Dent and Gary Walker from the Gosportarians and to Johnny Reilly from the Reilly Enterprise. Hi, I’m Rachel Webber, the Community Champion at Asda Gosport. The Asda Community programme is here to help make the community around our store a better place to live, work and grow up in. If you'd like to find out more, or see how I can help your school, group or good cause, please call me on 02392 524731 ext 222 or ask for me at the store.